Gardeners limited in space can enjoy all the fun of rose growing by cultivating miniature roses in containers. They also adapt well to flowerbed edging, front-of-the-border socialising with perennials and annuals, and low hedges. Miniature roses first came into being in the early 1930s as an accidental result of rose hybridising. Since then, master miniaturists have created many jewel-like varieties featuring perfectly shaped tiny blooms on clean, healthy plants that generally stay under 60 cm height. Miniature roses respond to all the care basics of regular-size roses - deep irrigation, sunshine. and regular fertilising - but they do need extra winter protection in colder climates. 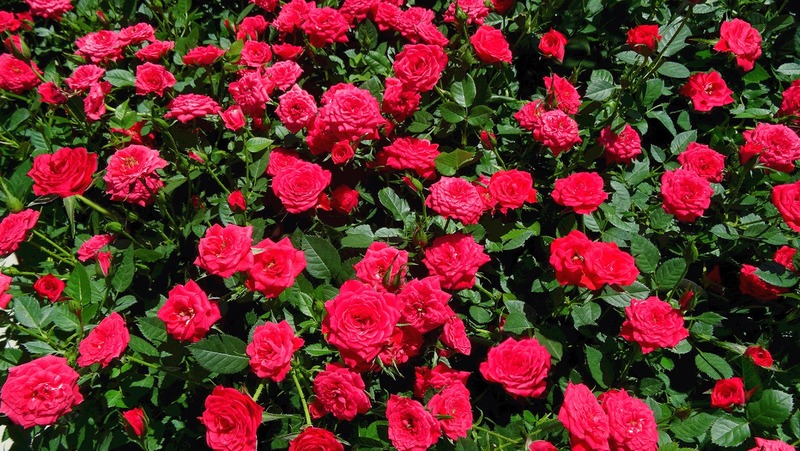 To ensure the plant doesn't die back to the roots, in Zone 5 and below, bury the rose plant in a mound of soil. Happy Valentine's Day from Floral Friday Fotos! Lovely! Happy Valentine's Day everyone and enjoy your weekend! Hi! Thank you for sharing. What a profusion of rose on those minautures - fabulous. Happy Valentine's Day to you as well. Red roses are so hard to photograph. Do you use a Canon? I have a lot of trouble myself getting the fine gradations of color in the petals. I think it's the red color. But the profusion of blooms you shot is wonderful. I love the miniature roses! Last year my husband got me a little white miniature rose for Valentine's day! I took the pot outside in the shade and I almost killed it. In the fall I decided to plant it in my roses bed and it loved it! I hope that it survives this hard winter! I suggested to my hubby that this Valentine's Day all I want is a another mini-rose but a red one! I even told him where to buy it from! Will see if my wish comes thru. Happy Valentine's Day, I love this miniature roses, they are so beautiful! Happy Valentine's Day. The roses are lovely.